If you like today’s haiku, Carpe Diem, hosted by Chevrefeuille, offers daily writing prompts and lectures on the art of haiku and related forms. Thanks for joining me today and below are a few more posts from the Carpe Diem library. Enjoy! Bickering sisters… Lovely! I liked the simplicity of both of them… so well-pictured. I love the illustration and the story of the sisters. Ooo, i am happy a song came up for you – always nice when we can carry tunes to sing the day away. ☼hugs, Sonel!! Isn’t the beach a No Bickering Zone? apparently not for these two, Frank – someone should throw them into the ocean. 😆 i’m still laughing on your hump day camel commercial. ☼hugs! BTW – the commercial does air on other days besides Wednesdays. Absolutely … and I will probably use it again … after all, I like it! perfectly described my older sister and I! I love the haiku….And the sweet sisterly love 🙂 Amazing ! Wonderful set Sun, but that last haiku is going on strong. Love to use that one in our Tan Renga month upcoming november. 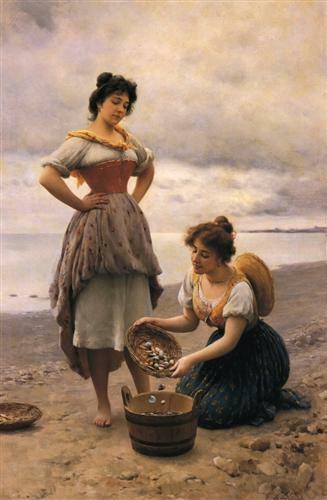 wonderful story embedded in these two haiku… will she sell sea-shells by the seashore? How beautiful this haiku is. I adore your website! Pingback: Gathering Seashells – TRM | "On Dragonfly Wings with Buttercup Tea"